REJUVENATION daytime – 2 oz. REJUVENATION daytime – 4 oz. Rejuvenation daytime – 8 oz. REJUVENATION daytime – 16 oz. AMOR NATURAE nighttime – 2 oz. Amor Naturae nightime – 8 oz. No More Bugs – 2 oz. No More Bugs – 4 oz. No More Bugs – 8 oz. No More Bugs – 16 oz. Natural Insect Repellent – 16 oz. NO MORE BUGS was created out of need for a natural (crushed or steam distilled only) plant-based insect repellant safe for kids yet hardy enough for the buggy woods of Vermont. Effective for keeping safe from No See Ums, chiggers, ticks, mosquitoes, all the biting flies in New England, and even the fire ants of Arizona, NO MORE BUGS has been used for over 20 years on kids and adults and works with your individual body chemistry to mask the scent of your blood with plants scents that bugs are not attracted to but that most people find refreshing. Spread on exposed areas and repeat as your body chemistry requires. Everyone’s chemistry is different so the amount of time an application lasts will vary person-to- person. In buggy areas I apply it about every 4 hours. In not-so-buggy environments I apply it about once every 6 hours if I am outside that long. One bottle lasts quite a while because each drop spreads so evenly! External Use Only! Horse people LOVE this size! Spread the oil in the ear fluff, near their hooves, on the fly mask, comb through their tail! Note: If your pump won’t pump or if there is a kink in your tube preventing it from pumping, please twist open the ribbed capping, carefully pull out the tube and cut it to the desired length. The tubes come to us as you see them and it is perfectly ok to cut your tube to your desired length and/or gently bend it as you wish to assist the pump action! Thank you! Packaged using Paba Free PET Plastic. INTERNATIONAL ORDERS PLEASE EMAIL YOUR ORDER TO alexia@livingblessed.com for a custom invoice through PayPal. Living Blessed Community Foundation 501c3 is committed to producing clean, organic, simple, natural, non-gmo and gluten-free products that promote personal balance in health, a greater degree of independent personal health as a consumer and stewardship towards the use of our planet’s resources. I've been buying the Rejuvenation oil for almost a year now and have tossed other moisturizers and lotions in the trash. I love this stuff! It goes on your skin smoothly, does not feel greasy and moisturizes beautifully. I literally use it from head to toe. I use it on my face and my skin tone and discoloration has improved. I highly recommend the product. Thank you! I have tried many skin products over the years, trying to find the perfect one. Rejuvenation Oil is it!!!! A pure product that not only moisturizes, but truly does heal and revitalize damaged skin. This is the only product I will be using from now on....LOVE IT!!!! I don't write testimonials. Ever. This is my first one becuase this product is PHENOMENAL! I am 44 and the back of my hands have always looked extremely aged 20+ yrs beyond my age, and I had a dry, flakey patch on my hand that never healed. No lotion ever made a difference. I started using this Oil and within a few weeks, it literally turned back the hands of time on my hands! The dry patch of skin that I had for many years, is now GONE. My hands now look a decade younger than my age. So, I started using the Oil on the smile lines at my eyes. Same thing. SIGNIFICANT, INCREDIBLE improvement. Without telling my boyfriend I was using this Oil, after less than 2 months he told me he noticed that my eyes were looking younger. No joke, he noticed without any prompting from me. I will give this Oil as a gift to every woman in my life that I care about!! Have not bought any more clinique facial products since using this product. I'm so glad I stopped by the Farmers Market and bought some. Started using it just on my arms, torso and legs and it made such a difference started using it on my face. My wrinkles are dramatically lessened throughout the six months I have been using this. And it's a lot cheaper than clinique!!!! I have trigeminal neuralgia and the itchy scalp that comes with it. I purchased the rejuvenation oil and after two days my itchiness is under control. I will be using this product daily in the morning and at night. I went to Costa Rico for one week and I'm the only one without bug bites! Everyone else used commercial products and turned their noses up at me and my natural product (NO MORE BUGS). I didn't even use the whole bottle! This past winter in Tucson, Arizona was bare feet weather. I wore my sandals out yet at home bare feet everyday. Yes my feet would get very very dry and cracking. At times it would cause discomfort and my cracked dry feet would stick to my sheets at night, even though I would have cleaned my feet. BUT, once I was given Living Blessed Amor Naturae: Nutrient Rich night Time Moisturizer, absolutely no more problems with my feet even on the very first night I used it. They look gorgeous! My feet are smooth without doing anything except a good foot wash. I discovered it works well on my dry desert face on and neck, too. Now I'm ready for bed and feel like a million dollars. Thank you very much. No more pedicures for me! P.S. The Living Blessed product I use at night soaks into my feet, face and neck immediately. It does NOT make my skin oily. I bought Living Blessed Moisturizing Oil about a year ago. At 58, I had an eyelid that folded itself over my eye socket (correctable by surgery, which my sister indulged in, I couldn't afford), and after a year of LB application, my eyelid is back to perky, no droop! It's a remarkable transformation I wish I had taken photos of, but I didn't expect it to happen, and so I didn't document it. In addition, I use no toners, serums, special creams, strictly and solely LB Oil over my whole body, face and neck. So simple! So inexpensive, compared to what I used to shell out for products that don't even deliver results, healthily, and non-toxicly, as LB does. Also, my 'beauty regiment' is streamlined and simple. I couldn't be happier! Thanks Ally, you wonderful brainiac, for this terrific, indispensable product you provide. I am so thankful! I am thrilled with the lip care product. After one week of applying a few times a day I have noticed a dramatic difference in how my lips feel and look. I have tried just about every lip product out there for the last several years - naturopathic to conventional and haven't found any that come close to the healing attributes of the Osculatus Natura. I have always dealt with chapped lips. Living in Tucson the last few years the condition has worsened. I now not only get chapped lips, but cracked, stinging and burning as well. With the Osculatus Natura product, after one week, my lips are softer and there is no sign of the broken skin and burning and stinging has subsided. I feel like the skin is healing not just being moisturized like many lip care products out there. I am so happy with this product. I will be buying more and will make sure to pass it along to friends and family in need of some nourishment. Thank you! My father has a degenerative skin disorder that causes the skin on his hands to crack and often bleed. Since using the Rejuvenation Oil his hands have almost completely healed and the pain he had in them has virtually disappeared. I use the Rejuvenation Oil on my face and hands every day as well, and it seems my skin's natural oils have balanced leaving my skin looking and feeling younger and more supple. I have never gotten as many compliments on my skin as I have since using the oil. My best friend, who also has a chronic acne problem has started using it on occasion and she has noticed that the blemishes on her skin have been reduced, as well as past scarring from the acne has diminished as well. Now all of us can't go without it! I just wanted to let you know how fantastic your product is. I purchased the Rejuvenation Oil and used it for a painful breakout on a sensitive part of my body. I feel that it in combination with other natural remedies,helped my breakout heal completely. I still use your oil today as I love how it makes my skin feel. Thank you for providing such a great product. Best wishes to all of you who work to make this product available to the public. 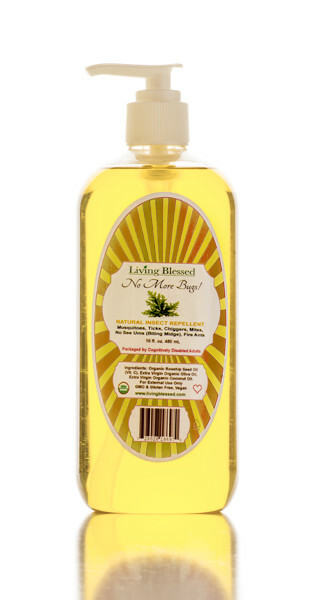 I received a tester sample of "Living Blessed - No More Bugs" at a store and I truly LOVED it! I hope I receive my order fast because I don't ever want to be without it. The very BEST feature of this product is that there are NO CHEMICALS! I use No More Bugs to help keep bugs and gnats away from my horse's face. (I use a fly mask when he is in his stall, but when I'm riding him he can't use the fly mask, and so No More Bugs is a great way to spare him from bugs during our ride.) I love that it is non toxic, safe for me to use on myself as well, and the small size fits easily into my grooming tote at the barn. Love this product! This stuff works! AND, I've used everything natural to keep mosquitoes from driving me mad. My second favorite thing about No More Bugs is the beautiful scent. It's a bit strong smelling at first, but quickly becomes subtle and lovely. I am a serious gardener with a greenhouse and huge garden in AZ. I was plagued by biting ants and mosquitoes for 2 years and tried every repellant on the market. Then I tried this oil. It is unbelievable -- it keeps all bugs off of me, including the biting ants that pop up everywhere we work. Thank you so much for this wonderful product! I first used Living Blessed Rejuvenation in December 2012. I had been suffering from postherpetic neuralgia of the face and scalp and terrible itching of the back as a result of back surgery earlier that month. Just a few minutes after I applied Rejuvenation to my face and scalp, the pain from the shingles was greatly relieved. For me, this was a miracle as I had used many very expensive medications with no help. Using it on my back completely relieved the itching with just a once a day application following my shower. I now use it also as an aftershave. This is a great product and I will be a continuing customer. I had carpel tunnel surgery which left my elbow skin darkened and so dry that the skin would crack and bleed. I used emu oil for a long time but I would have to apply it throughout the day. I use this (Rejuvenation) once in the morning and once at night and the cracks never come back. The relief feels so good! Rejuvenation makes my skin extremely soft and lasts all day. I have received so many compliments on the way it smells. People have told me it attracts them to me because they like the smell. I have been married ten years & suddenly my husband can't keep his hands off me. I like that! I like that my skin feels so soft & healthy. I work outside in the tourist industry as a sculptor year round. I use Rejuvenation to heal sunburn and to replenish the nutrients in my skin after using harsh soaps to remove chainsaw oils and grit from my hands and face. I notice immediate softening and renewed pliability of the skin on my hands and face. My food industry work dries & cracks my skin. Lotions never work for me. A few days using this product has healed the cracks around my nails and fingers, and my calloused feet are now soft. I love this totally natural product. The light fragrance is calming and you only need a few drops for relief. I wholeheartedly recommend this product. Diabetes severely dries my skin. Rejuvenation is the only product I’ve ever found that is affordable over time and works. I only use a few drops and it lasts all day. My skin feels rejuvenated, smooth, soft again, and all the itching is gone. I’m an auto mechanic for a well-run, busy shop. My hands get so cracked & torn up. I used this oil for almost a week when I realized the dry skin was gone & the cracks had healed. As long as I use it my hands stay healed. I have had really painful psoriasis my whole life. I think I am growing new skin; I know I am! The color is almost matching my other skin for the first time in 29 years. I have gone to the dermatologist since I was 20. The cream he had me on was a known carcinogen. My skin was all white and cracking around my left knuckles and forefinger. I had no feeling on my hand and I had to put it in steaming hot water and rub and rub, just to feel anything at all, just to get the circulation moving. I had given up hope and then I found and tried Rejuvenation. I have new skin, and I can feel my fingers and the skin for the first time in so many years! I had an appointment for the dermatologist, but I canceled it. I am so happy! I work for Dreyer’s Ice Cream. I am in the freezers 6 days a week. My hands dry out even with the plastic protective gloves. Rejuvenation is the best relief I have ever found in any product and it is all natural. It has a pleasant smell and feels so good. It’s a great product and helps employ disabled people! You will be successful! I am going through chemo and radiation treatment which had turned my skin to parchment. My practitioner said I needed to do something quickly to heal my skin. Living Blessed Rejuvenation oil saved my skin, healed the sores and hot spots and makes my scalp not burn. Thank you so much for making such a blessing of a product for me and others going through chemo. My boyfriend and I travel a lot. I LOVE No More Bugs!! I used it against mosquitoes in Costa Rica; it works and it has no harmful chemicals!! I take it everywhere we travel! During my first trimester I used Rejuvenation about once every other day. I had a lot of morning sickness, so I stayed away from almost everything. Once that passed, I used Rejuvenation every night after showering, and every morning. I have NO stretch marks whatsoever!! Thank you! Rejuvenation needs to be on shelves everywhere, honestly, it does. purchased this as an effort to speed up a painfully slow recovery of a rash on my feet from using another product that I know now I’m allergic too. I’ve had these ugly rashes for over 6 years and “Living Blessed” oil is the only product that has been able to reduce the swollen, red and calloused areas. Results can be seen within a week but even may be noticeable the next day. Beside a healing salve for rashes this product is a great moisturizer, that works with the skin to hydrate itself to its natural healthy glow. Even though it’s completely oil-based once applied the skin isn’t greasy at all. One small container goes a long way too. Highly recommended. Besides using No More Bugs for myself and horses, I also use your regular oil for everyday use. My husband got a sunburn on his neck and it has been driving him crazy with the itching (not even aloe would help). He tried your product, and it really took away the itching. I love it that your products work, are effective, and are made in a way that is socially conscious with having developmentally disabled adults work on the packaging. All these things make me feel great about buying your products. Keep up the great work!Thanks for an incredible product line! LIVING BLESSED REJUVENATION 2 fluid oz has been my travel companion thru India, China, Canada, USA+Mexico!! i appreciated the 2oz as it is also an approved carry on weight, but whether i carried it on or checked it, my container NEVER LEAKED on planes, trains, ships or buses!!! a little goes such a long way that i had lotz left after a two month backpacking adventure!! thank you Alexia for a quality product. I love this oil.. I am 70 and have been getting those lovely age spots on my arms.... I use the oil and then they fade away!! Also, I used it on a burn and it healed it faster than normal. I am going to be giving some to my sister who is a bit younger than me. And I have a friend who is trying it out, too! Keep up the good work! I love the Living Blessed product line. It goes on smooth, works quickly and is great for dry skin. noticed you have a 4 oz bottle, which I could use to refill it. chemo drugs). I found you in Tucson, but I live in Minnesota. pain. I use it all the time to keep my lips moist. I love it! My name is Erin and my Dad (Dominic DiAngelis) bought some of your products from you to give to my sister and I. I just wanted to say thank you for doing such wonderful work in the world. Your product is truly making a difference, and I admire people like you who are so dedicated to sharing what you believe in while giving back to others.